We love, love, love the A Charlie Brown Christmas special, and we watch it over and over again. I’ve been having an ongoing headache (3 weeks today! ), so we’re watching it a little more often than usual. I spent yesterday at church, then getting an MRI, then baking our muffins, bread, etc for the week. I had put some pinto beans in the crock pot for dinner, and planned to have G2 and G3 make cornbread, but I rallied and got that done. The extra painkillers I’m on for a few days have helped a bit, but there’s still pain. That makes me tired and less willing to do fun things. I end up feeling really guilty about that later, so I wanted to make quick, cute lunches for my girls to somewhat make up for snapping at them for singing Pokemon and My Little Pony songs constantly. Beau at Lunchbox Dad made a Charlie Brown Christmas Lunch, and used a Babybel cheese to make Snoopy & his doghouse. After finding a big bag of Babybels at BJ’s, I figured it was worth a try. So, here are Snoopy Christmas lunches 3 ways, all using the same cutter forms, but using different protein sources in each. The girls asked for the Lunchbox Love jokes in plastic sleeves, so those are included. They aren’t as excited about the Lunchbox Love Christmas notes, and would like them a lot better if they were Christmas jokes! G3’s lunch is a B(no L, no T) sandwich in her Easy Lunchbox. I used Snoopy and Woodstock molds to cut the bread, and then used food-safe markers on toasted homemade gf bread to make them look more like the characters. She also has a Snoopy doghouse made from a Babybel cheese and food-safe markers. At the top left she has a rice krispie treat with mini Christmas M&Ms and a snowflake pick. At the top right she has part of a giant orange, plus a snowman snowglobe food pick. In her pink Laptop Lunch Bento Buddies container she has Pirate’s Booty, and in a Snoopy snack box she has more of the giant orange, and a (apparently invisible in the photo) Christmas-colored meringue. The alphabet food picks in the orange spell out XMAS. In G2’s Easy Lunchbox she also has lunch cut using the Snoopy and Woodstock molds. She, however, has a cheese quesadilla cut into Snoopy & Woodstock shapes, with details added using food-safe markers. She also has a Snoopy & doghouse Babybel cheese in the same section. In the top left section G2 has a Christmas rice krispie treat, with a Christmas meringue on top, plus a snowflake. The top right section has the final sections of the giant orange that she’s sharing with G3, along with a mittens snowglobe food pick. As in the past, G2 and G1 have their salt & vinegar chips/Pirate Booty/Smart Puffs of choice in an accordion container. I wrote about our lunch packing extras here. G1 also has a Snoopy and Woodstock themed lunch. She has tomato soup in her Thermos, and has everything else in her Totoro Bento Box. At top is the lower, sealed section, she has a Snoopy and doghouse Babybel cheese in a silicone heart cup. She also has Snoopy and Woodstock cut out of tofu and detailed using food-safe markers. At bottom is the upper container, which is vented. In silicone cups are a Christmas meringue and a Christmas-themed rice krispie treat, plus a snowflake pick. I packed her pinapple chunks in an EasyLunchboxes Mini Dipper container along with a snowflake. 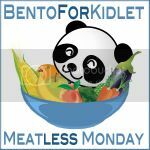 This post is linked on Meatless Monday from Bentos for Kidlet and Bento Blog Network as well as What’s for Lunch Wednesday and Fun Food Friday. We had wreathmaking last night, so G1 and I went over to our church and made wreathes with a bunch of women from church and their friends. The young women (12+) were there, too, and it was loud, busy fun. I look forward to this every year! Plus, we now have pretty wreathes for the front and back doors. Anyhow, after working all day, going to the activity, returning3 hours later, getting everyone ready for bed, doing our Advent activity, and cleaning the kitchen, I was exhausted. Today’s lunches, with the slight exception of G1’s lunch, were super-easy and just decorated with snow-related food picks. I also used the Lunchbox Love Christmas notes to perk up their lunches. G3’s note talks about how in the Ukraine the youngest child watches for the evening star to appear to tell the family when to start the Christmas feast. She’s going to love that! The other two cards are cool, too, but G3 likes anything that makes the youngest child special. G1 doesn’t usually get the cutest lunch, but she won the lottery today. As is par for the course, she has tomato soup in her Thermos, and has protein, fruit, and cookies in her Totoro Bento Box. On the left, in the vented top section in a silicone heart cup she has two Christmas-colored meringues plus a mittens snowglobe pick. In two EasyLunchboxes Mini Dippers she has pineapple chunks with the word SNOW spelled out with alphabet food picks, a snowflake pick, and a Mickey Mouse hand waving at her. In the bottom, sealed container she has two snowmen made out of tofu using a snowman cookie cutter and decorated with food-safe markers. She has a couple more snowflakes, too. G3’s lunch includes a Thermos filled with chicken and rice soup, which isn’t in the picture. In the pink Laptop Lunch Bento Buddies container on the far left she has some Pirate’s Booty. The indigo one has some Honeycrisp apple slices and a snowflake. The pink Bento Buddies container has one lemon square inside a silicone heart cup with a mittens snowglobe. Completing her lunch/snack she has a Snoopy bento with some more Honeycrisp apples and another snowflake. Finally, she has one Christmas-colored meringue and some Junior Mints with candy cane pieces. In G2’s Easy Lunchbox she has a quesadilla made with gluten-free corn tortillas. She got into quesadillas again after I made corn and bean quesadillas Wednesday night, and asked for one today. I added several different food picks to make it a smidge more festive, including a snowman snowglobe , a snowflake, and a couple different penguins. At the top right she has some baby carrots, a snowflake, and a little bunny container I filled with ranch dressing. At the bottom right are two Christmas-colored meringues and a Happy Feet penguin cupcake ring. 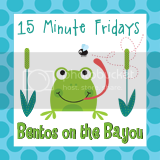 This post is linked at Fun Food Friday and Bento Blog Network – Snowmen. After finding out that yesterday was Rainbow Dash Day, the girls asked me to find out if today was a special day. After much googling, I found out that today is Ninja Day. The girls each have a few of the Unstealthiest Ninja shirts from shirt.woot, so they put those on, and I tried to find a way to make Ninja lunches. This isn’t the first time I wished I had a set of Ninja cookie cutters, but they would’ve been perfect for today. Instead I just used a regular gingerbread man and a star for a Ninja throwing star. G2’s lunch might well be the best of the Ninja lunches. She has a Lock & Lock with tomato soup, because her school has microwaves the students can use, and her sisters were using the two Thermos containers. So, in her Easy Lunchbox she has homemade gluten-free bread that was cut into the general shape of a Ninja and a throwing star, then toasted to a dark color and eyes drawn on with food-safe markers. To her provolone and mustard sandwiches I added a homemade star food pick and most of the letters for the word NINJA (protip – buy at least two sets of alphabet food picks so you can write entire words). I’m claiming the second N in NINJA is being stealthy. The smaller section at the top right has baby carrots and a little panda container filled with Ranch dressing. At the bottom right she has a cupcake-sized gluten-free chocolate chip cheesecake with an appropriate star-shaped chocolate on top, and a homemade star pick. G3’s lunch has a Thermos filled with chicken and rice soup. In her Snoopy bento snack box she has a cheesecake with a star on top and a homemade star pick. In a Bento Buddies container she also has half a Honeycrisp apple, cut into sections and dipped in lemon juice to prevent browning. In her Easy Lunchbox she has tortillas that were cut into Ninja and star shape, then toasted in a skillet and decorated with food-safe markers. In the top side section she has a rainbow meringue that has a bit too much red & green food coloring. The bottom side section has half of a navel orange and a homemade star pick. In G1’s Thermos she has leftover gluten-free spaghetti, marinara, and roasted garlic chicken sausage from Trader Joe’s. She has a few add-ons, too, of course. In her Laptop Lunch Bento Buddies container she has two Christmas-colored meringues and a homemade star pick. In her Snoopy bento snack box I packed her a set of Ninja and star toasted tortillas with some food-safe marker decorations. She also has another Bento Buddies container inside the Snoopy box, and in that she has some baby carrots and celery, plus ranch dressing packed into a little panda container. I added one more homemade star pick for good measure, too. This post is linked on Fun Food Friday as well as Leftovers on Friday. This post includes affiliate links, as well as non-affiliate links. On previous Thursdays and Fridays I’ve mentioned that I only had to do lunches for G1, as the younger two were with their father. Well, he has a new job (yay! employment is good! ), and needs to drop the girls off at 6am (boo!). He expects them to pack their own lunches at his house, so they asked me to make their lunches for Thursdays and Fridays. This means 21 lunches a week instead of 17. Somehow those 4 extra lunches seem like a lot. Anyhow, after my monthly Movie Night last night (we saw The Great Gatsby, and it was gorgeous), I had to make their lunches. I didn’t get home from the movie until quarter after 11, so I needed to do quick and easy. G1 just made High Honor Roll, G2’s grades close next week, and G3 has auditions today and Monday for the school play. So, I used the You Did It! set of food picks to decorate their lunches, then decided it was time to break out the FunBites Square I had bought to make it cuter. FunBites worked so, so, so much better than I thought it would, even with GF bread and with slightly crunchy brownies! The girls all have Lunchbox Love jokes today, too. Two are recycled from yesterday thanks to the plastic sleeves that keep them dry and not icky. G1 has an unpictured Thermos with leftover gluten-free spaghetti, sauce, and sausage. In her Totoro Bento Box she has pineapple chunks in the bottom, sealed, section. She has a mini fork with a heart on it, some panda food picks, and a pick to show off her A+ work. I’m so proud of her I was willing to risk embarrassing her! In the top, vented section she has a mini panda container with Parmesan for her spaghetti, then brownies cut up using the FunBites Square and skewered on stars and pirate swords, and laid in panda cups. The last time I gave her pirate swords she and her friends had a duel during lunch. I’m curious to find out if that happens again. I wouldn’t suggest giving them to young kids in elementary school, as they’d likely be taken away as a weapon, but in high school they don’t police them as much. G3 had some chicken and rice soup at my mother’s during lunch after her last half day, so she broke with her chicken noodle soup tradition and requested that for lunch in her Thermos. In her Easy Lunchbox she has a few animal-shaped bread punches cut from one slice of gluten-free bread, and quick details with food-safe markers. In the smaller of the two sections on the right are brownies cut into squares and impaled on pirate swords. I’m fairly confident that the 4th graders aren’t well policed for possible lunch weapons – our school has one large school for all the 4th-6th graders, and they eat in the cafeteria rather than in their classrooms as they did for K-3. In the larger section are a few Honeycrisp apple sections with a You’re #1 pick. In her Laptop Lunch Bento Buddies snack boxes she has a brownie that says “HI” with alphabet food picks and some pineapple chunks that tell her she’s a Star Talent. I hope her first day of auditions goes well! She has a second day of auditions coming up on Monday, and they’ll find out roles the Monday after Thanksgiving. G2’s lunch was easiest today. Which is good. She was supposed to have “WWI artifacts” for her exhibition project that was due today. We didn’t have access to any actual artifacts, so she had to make them. They each wrote a realistic fiction short story about WWI, and G2 wrote about Christmas in the Trenches. Sadly, her teacher cut most of the funny bits she had written, but didn’t cut the part about the Red Baron battling a Sopwith Camel. Yay Snoopy! Ahem. Anyhow, she needed to bring in a helmet and wine bottles (with homemade labels), plus a huge tri-fold poster board which was decorated with Christmas lights, photos, etc. By the time we were finished, I had burned myself a few times with the hot glue gun, she had used up all of our glitter glue, begged several favors (it’s not easy for a Mormon to find empty wine bottles), and I was fed up with both her and her Charter School. So, her Lunchbox Love note reminds her that I love her to pieces (plus there’s a joke on the back). G2’s Easy Lunchbox includes a provolone and cheese sandwiches on homemade gluten-free bread cut up with the FunBites Square and skewered on stars and pirate swords, Her Charter School is the one I worry most about with the pirate swords. It’s rather a hippie school, and they could categorize them as weapons, especially if she and her friends duel. She has fewer kids in her school than either sister has in just their grade, so there’s a lot closer supervision. In the small section at the top right she has a brownie with a You’re Awesome pick, because she is, even when she’s annoying. In the bottom right section she has Honeycrisp apples with two cute penguin food picks that (when you can actually see them properly) look like the penguins are eating her apples. I had one specific lunch decoration request, then the rest was an exhausted lunch-packing group of randomness. The older girls went ice skating, so I let G3 watch one of her favorite shows, The Vicar of Dibley, while I worked on my NaNoWriMo novel. Time went far too quickly, and too soon the older girls were home and it was past bedtime. On the plus side, I got 3 pairs of used skates for $6! G3 wasn’t very happy with yesterday’s What Does The Fox Say lunch, so when she said she insisted on a Pikachu BL(noT) sandwich on homemade gluten-free bread, I muttered about her being unappreciative happily complied. The eyes, cheeks, and tongue for Pikachu are colored with food-safe markers. In her Easy Lunchbox I included a brownie and some Honeycrisp apples, along with Pikachu’s name spelled out using alphabet food picks. I realized belatedly that you really need more than one set of those in order to spell words in more than one lunch. Or even to spell 1 kid’s name (with 1 set I can’t make any of their names, never mind more than one kid’s name). In her Laptop Lunch Bento Buddies snack box she has another brownie, a few Honeycrisp sections, and a few pieces of pineapple. I added a couple crown food picks, because she’s a princess. She’s my animal lover, so I also threw in a puppy & a bunny food pick, and stuck the pineapple in a couple animal silicone cups. Because all of today’s lunches were random, I also added random Lunchbox Love jokes. While the girls like the little facts and inspirational Thanksgiving notes, they love the jokes. G1 asked me to put last night’s leftover spaghetti, sauce, and sausage in her Thermos. In her Totoro Bento Box she has some pineapple with panda food picks inside silicone heart cups. In the top section she has two brownies, again in silicone heart cups with different panda food picks. Because we use the plastic sleeves for the Lunchbox Love jokes, I was able to reuse G2’s joke from Tuesday in G1’s Wednesday lunch! Yay me! Even with the understanding that today’s lunches were random, G2’s lunch looks especially random. She has leftover gluten-free pizza in her Easy Lunchbox. I added the mouth from a Sully (Monsters U) Lip Pop to her pizza and added a couple spooky candy eyeballs I bought on clearance locally after Halloween. In the top right she has a brownie with the word “BYE” written using the alphabet food picks. I had trouble coming up with a good monster word, so bye it was. In the bottom right she has Mike (Monsters U) Lip pop mouth with a solitary candy eye. Very random lunches, but they definitely fit the personalities of each child! Today’s lunch was pretty boring before tweaking it, and for the first time I can remember that their lunches are identical! (G1 ended up staying home yesterday, so her lunch from yesterday went to school with her today instead.) In their Easy Lunchboxes, G2 and G3 had leftover gluten-free pizza, gluten-free brownies, and sliced Honeycrisp apples that were dipped in pineapple juice to keep them from browning. I had added some scarecrow and leaf food picks, as well as a couple turkey picks before deciding to add the foxes. To make the foxes I simply took a slice of orange cheddar, and used a Christmas star cookie cutter to cut out a cheese star. I then used a paring knife to cut the ears out of the inside of the two top points of the star. I added candy eyes, then cut a triangle out of an olive to use as a nose. I tried to draw whiskers that went out into the side start points, but I had warmed the cheese so it would stick to the pizza, and drawing on warm cheese doesn’t work. I’m hoping that they see a fox even without the whiskers. I’d highly recommend adding the whiskers (or doing any additional decorating using food-safe markers) before warming the cheese. To make it clear what they were looking at in their lunches, I added the words “Fox” and “Say” using alphabet food picks. If I had more time, I would’ve used my alphabet cutters to cut out more cheese to say Ring-a-ding-ding or something similar, but it was getting late, and I was tired. Today’s lunches also have a couple Lunchbox Love jokes. I’m not an LBL affiliate, so I get nothing by telling you that there’s currently a 25% off special – 13LBL25 – for these cards, which we love (and cover with plastic card protectors so we can reuse them). As with all of the girls lunches, they were also packed with a crunchy snack and a seltzer water. This time they had Pirate’s Booty and Smart Puffs rather than cheese.